Tomorrow I get to teach with a 1st grade teacher, Lisa! I am super excited! To give a bit of background, the students up to this point have done a lot of dot image number talks. These talks have been a mix of just dots with no particular order and others with subitizable dots. The main focus has been becoming aware of how students are organizing and/or combining the dots. Are they counting all? Counting on? Using known facts? Or using any combination of the three strategies? In their Investigations work, they have been building on these talks using the 100’s chart and number lines to represent the addition and subtraction contexts. 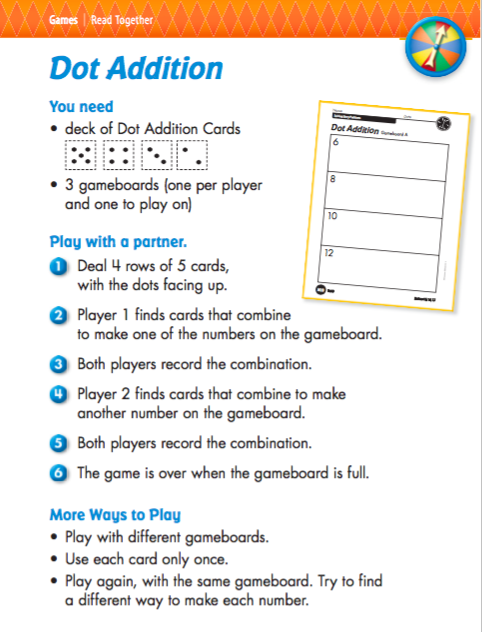 Today in class the students will be learning how to play Dot Addition, so we will be building on that work tomorrow when I join them. We decided to build on this work and launch the lesson with a string of three dice images. Just to make it a bit interesting, we set the dice equal to each other and ask them how we could prove if it was true or false. Image 3 – See how they talk about decomposition with three addends versus two. Can they be equal with more on one side? Observe them play on the new game board and take note of how students are find the sums. Pull out strategic expressions that we want to highlight in the group share. Ask students what they would do if they didn’t have a card they needed. For example, what would happen if there was no 5 and you needed it? What could you do? or Could you have made that expression with more than two cards? How do you know? After they play, we have two options. If there are a variety of expressions, we will bring them to the carpet to look at a completed game board from my game with Ms. Williams that contains the expressions they have arrived at also. 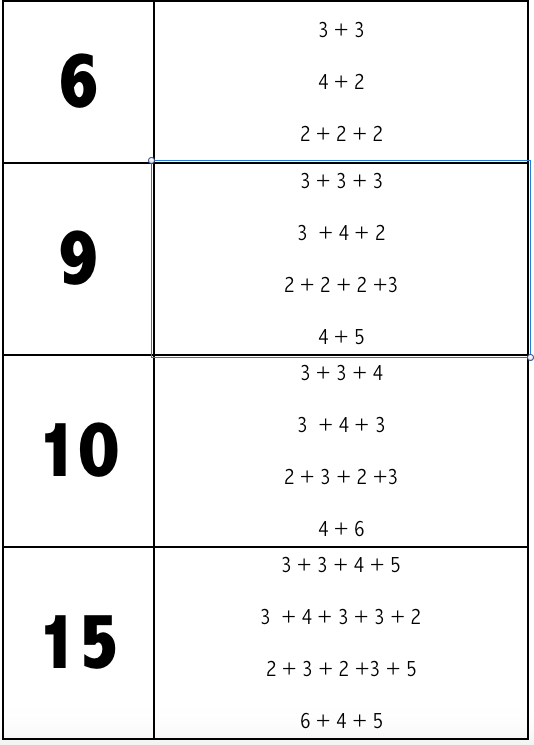 If there is not a variety, we will complete a blank sheet together, gathering all of the expressions they did have and then ask them to turn and talk to see if they could come up with different ways to write these equations with the cards. We were going to ask them to take a few minutes to look at the expressions within each sum and then talk about what they notice. For example, within 6 do they notice that you can either “move a dot” or decompose and the sum stays the same? If that goes smoothly and we make it this far without running out of time, we will ask them to do the same noticing between different sums. Do they notice that you add three to every expression in 6 to get to 9? Do they notice that somewhere in the 10 expressions there is an extra 1 from the expressions in 9? Do they notice the 5 when moving from a sum of 10 to a sum of 15? So much to see! I cannot wait! Would love any thoughts and I will be posting the follow up soon!! This entry was posted in 1st Grade, Dot Images and tagged 1st Grade, Dot Images on October 28, 2015 by mathmindsblog. Will be using the dot true/false as a fishbowl number talk with grade 1 teachers in Dec! Will let you know how it goes. I am sharing your blog with these teachers as a fab resource. So glad you are working with elementary as well! That is awesome, I think the fishbowl is such a powerful model in PD! I cannot wait to hear how it goes Jen! !